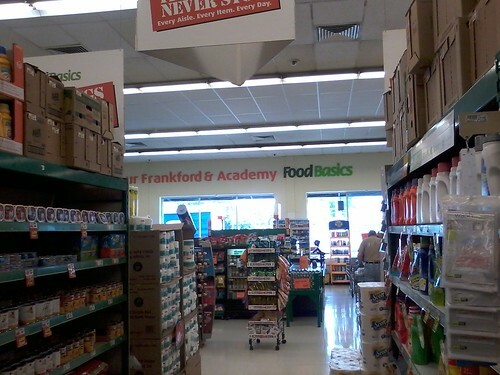 This week at P's and Q's we're taking a look at one of the only new-built FoodBasics stores. Most stores were former A&P powerhouse stores that had eventually lost their touch in the recession, as many lost their jobs. 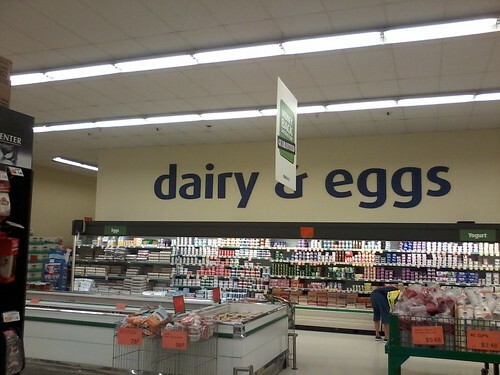 FoodBasics was the answer to all their prayers. 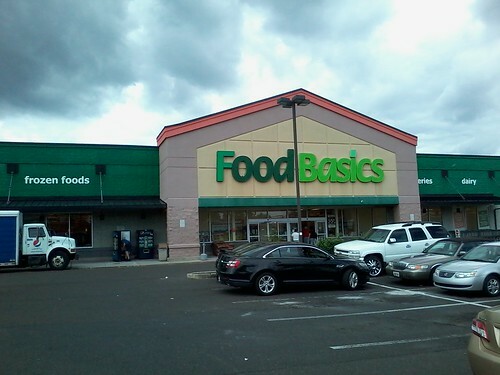 A 2000's-styled "Fresh" exterior commonly used on A&P Fresh stores, and a few Superfresh locations. Most used the more deluxe window version, but locations like Saddle Brook, Denville, and Columbus Blvd, used this type. Three-sided aisle markers! This is a first. But really only two. One side just has "The Savings Never Stop" slogan! Dairy & Eggs with some dump bins are along the back. 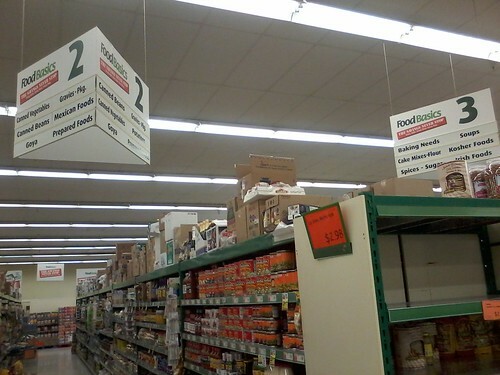 This store has an odd layout vs. the regular Fresh stores. You think it would have been cheaper to just keep the normal layout and have the same blueprints, right? Look across the front-end. You can see a little bit of the slogan signs I was talking about before above. 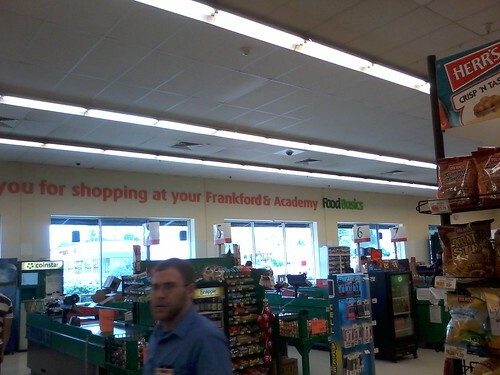 This store tops out at eight checkouts, a little bit smaller than the usual 2000's store. This store was closed in November 2015, and reopened a few years later as a "PJP" Marketplace, which specializes in 'low-priced food service'. A bit of a niche, don't you think? Looking at their site, they seem to be a combination of regular store and foodservice. They offer many items (at least in the ad) that are very much what you would get at a regular store, with the addition of some larger packaging that you'd think of coming from a food service distributor. So, I guess trying to be good for all - the smaller customers (both individual and small businesses that don't always need a case of something) and to those with larger needs (again both individuals having, say a party, as well as businesses). Obviously the store (since being in Philly) is open to the public. Unfortunately, most have small apartments or houses, so they can't fit a case or two of Pepsi, let's say. I get their point of trying to compete with the Wholesale Clubs, but by comparing their prices with Costco, it's unreasonable for a 24pk of Pepsi to be $8.99 when I can get 36 at the same price at Costco.